InMotion Hosting includes free Solid-State Drives (SSD) that offer higher performance than standard spinning hard disk drives. We proudly choose Samsung SSDs for our servers. Samsung SSDs gives you faster read/write speeds, between 94k-98k read and 88k-90k write IOPS. We offer 500GB-1TB capacity SSDs, in multiple RAID configurations to provide better performance and data redundancy. We are confident in our services. Therefore, we offer a Full 30 Day Money Back Guarantee, regardless of the Dedicated Server Hosting plan you choose. At InMotion Hosting, we grow with your company! Need a secondary drive? Faster RAID card? Simply ask and we will install it within 48 hours. Upgrade your server at anytime with InMotion Hosting. At Arvixe, you are locked into their offered plans. InMotion Hosting is employee-owned and operated. Being an independent organization, we can focus beyond just the bottom line. Our core values are built around meeting customer needs and constantly enhancing their experience. Our #1 goal is to thrill you, the customer! On the other hand, Arvixe is owned by a multi-national conglomorate. InMotion Hosting gives a generous amount of free dedicated IPs. InMotion Hosting partners with Cisco and Lenovo to provide hardware based RAID cards. Do you run a mission critical setup or a heavy database driven dynamic site? Or you simply want the highest performance possible. Arvixe doesn't state what they offer. We not only install your operating system's security patches, but also pro-actively check to make sure they are updated to limit security risks. We also update your cPanel so you have access to the newest and most stable cPanel & WHM features. Our 2 hour hardware replacement guarantee is an additional peace of mind service, where we will replace any faulty hardware within 2 hours of notification. Arvixe doesn’t offer this according to their TOS. Your business is not a cookie-cutter business, why should you use Arvixe's cookie cutter web server? With InMotion Hosting, you can upgrade your processor, add more RAM, or even swap out a RAID card with more cache. The options are unlimited. Want help optimizing your server or need special software installed? Need a caching solution and have no time to set it up? Our system admins can see that you start off on the right foot. InMotion Hosting offers time with our sysadmins, free of charge. Arvixe doesn't offer this service. InMotion Hosting comes with lighting fast 1GBps Uplink speed on all of our Dedicated Servers. Our fully managed dedicated servers come preinstalled with LAMP stack. Everything you need to start your new server right. InMotion Hosting partners with Corero to defend against DDoS attacks that lead to unplanned server outages. 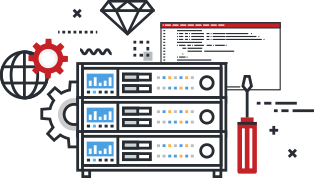 InMotion Hosting also has multi-layer, high-bandwidth switches that layer through various scripts and APIs to change the routing within the network itself on demand. All this to ensure you, our customer, stays online. Arvixe puts that responsibility on you.